While much of the bike world was getting amped about Sea Otter product launches, industry leaders got together to talk big picture at the Bicycle Leadership Conference in Monterey. MONTEREY, Calif. (BRAIN) — While the Sea Otter Classic opens next Thursday, visitors and wannabe visitors can get a headstart on planning and drooling over new products by viewing the official Sea Otter Classic Festival Guide online today. MONTEREY, Calif. (BRAIN) — Fazua, a German brand that makes a lightweight e-bike motor often used on road and gravel bikes, will appear at the Sea Otter Classic expo this month as it begins a push into the U.S. market. 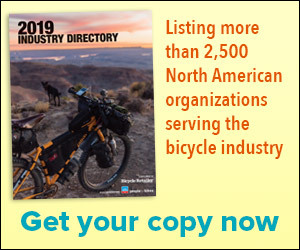 The company's motors are currently not officially available in the U.S.
BOULDER, Colo. (BRAIN) — Between VeloNews, Bicycle Retailer & Industry News and other media brands owned by Pocket Outdoor Media, April's Sea Otter Guide will reach the widest consumer and trade audience ever via print and online delivery. LAGUNA HILLS, Calif. (BRAIN) — Bicycle Retailer and Industry News is looking for new product information and news to include in its annual Sea Otter Classic Festival & Gear Guide that will be handed out at the four-day fest April 11-14. MONTEREY, Calif. (BRAIN) — Preliminary figures from organizers of the Sea Otter Classic show that the festival brought in a record 74,000 attendees, 8,500 campers and 9,800 athletes over four days of racing, a busy industry expo, bike demos, gran fondos, cycling tours and other associated events. MONTEREY, Calif. (USA) — SRAM's Quarq division has launched a wireless tire pressure gauge, which stays on the valve stem and communicates to a phone app or head unit. The Quarq TyreWiz will be available June 1 on Quarq.com; a two-sensor package will retail for $199. MONTEREY, Calif. (BRAIN) — Revelate Designs is showing the Vole, a bikepacking seat bag designed for use with dropper posts. The Vole is a mid-volume bag (6-7 liters) tailored for technical trail riding. MONTEREY, Calif. (BRAIN) — The Sea Otter Classic opened Thursday with an expo that includes more than 500 booths representing nearly 900 brands and covering 165,000 square feet of space at Laguna Seca Raceway. MONTEREY, Calif. (BRAIN) — Bike sharing is expanding so rapidly that city governments are hard-pressed to develop appropriate rules for companies intent on developing new markets. MONTEREY, Calif. (BRAIN) — While Pivot's Shuttle e-MTB was launched in Europe last year, it's making its U.S. debut here at the Sea Otter Classic. Pivot has sold out of the first three initial production batches for the U.S. A few of the brand's top dealers stocked them for the past few weeks.